The technicians in our welding department (above) are trained to perform even the most complex operations with precision. If you need to customize your application, look no further than American's powder coating (above) and silk screening (below) capabilities. At American Metal Crafters, each step of the manufacturing process is performed in-house according to strict quality standards. 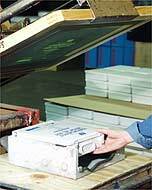 We pride ourselves in turning out the finest metal boxes and cases for all applications. At American, we have the manufacturing capability to customize all of your projects to suit your customers' needs and reflect your own company's personality. At American, each individual box is thoroughly inspected according to strict quality standards. At our 80,000 square-foot facility, we have a dedicated staff of employees working to make sure each box lives up to your standards. Our equipment includes shears, punch presses ranging in size from 10-110 tons, press brakes, spot welders, two wash systems and two state-of-the-art powder coating systems conveyorized through a bake oven. We can also add a more personal touch to your custom applications with silk screens and decals. 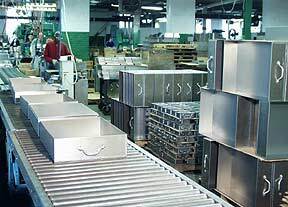 The latest run of metal boxes moves along the conveyor from American's welding department to its cleaning station.